Your once-sleepy Tuesday nights may never be the same. AFTER YOU COME THROUGH THE OLD CREAKY DOOR on Broad Street, climb the wide, steep staircase, and exchange your $10 for a green paper drink ticket, you gain entrance to a vibrant, candlelit “Speakeasy.” A small stage with red velvet curtains frames some “hot jazz” musicians: banjo, trumpet, and sousaphone—plus a percussionist playing a washboard affixed with a plethora of Spike Jones-esque noisemakers, including a small pot lid and a rubber chicken. The musicians all wear garb that hails from the days when men changed their collars, not their shirts. The wry banjo player who leads the Capital City Syncopators introduces each Jelly Roll Morton-era number with a patter so dry it crackles. The bouncy, tight arrangements fill the room with giddy energy, and generations of smiling dancers hit the marmoleum floor. Their arms intertwine while their feet kick and fly: balboa, shag, lindy hop, jive. Candles flicker on clustered tables, and underlit faces of listeners and watchers nestle together, conversing and sipping hand-crafted cocktails. Every Tuesday night at the Victoria Event Centre (VEC), this joyful, warm, wholesome scene plays out—like the antique silent films the organizers project on the walls. Speakeasy is the only place in town where ten bucks buys you a fabulous traditional jazz band, a fascinating drink poured by bartenders in bow-ties (they even use blowtorches to create some of the menu items), fun inspiration from gleeful dancers, and a fast trip through time to Chicago or New Orleans, circa 1923—but without any of the cigarette smoke, thank heaven. I’m curious how it all got started, and how come more people don’t know about it. Leading the collaborative effort to create Speakeasy on the musicians’ side was Victoria traditional jazz, klezmer and gypsy-swing multi-instrumentalist Avram McCagherty (he has performed with the Capital City Syncopators, Stomp Club, Yiddish Columbia State Orchestra, and Avram McCagherty Trio, among others). I sit down with McCagherty at the bustling Spiral Cafe in Vic West on a chilly December morning—he’s managed to squeeze me in betwixt the preschool drop-off and his weekly gig facilitating musical stage performances for the special-needs community. His family, faith observance, teaching, and professional therapeutic work all come before performing, he tells me. Somehow, though, I’ve seen him breathe a whole lot of life into our local music scene over the years. I ask him how he ended up anchoring the live music aspect of VEC’s Speakeasy offerings. “The people at the Event Centre are some of the best people I’ve ever worked with,” McCagherty enthuses. “Their main focus is justice, and doing what’s right. They’re great people; they saw…that [Speakeasy] could be a soft landing for some of those musicians.” The VEC reached out to McCagherty to take on the role of music director for that night. It was an easy “yes” for him. “Traditional jazz is my thing,” he says: “pre-bebop, pre-concert-hall jazz. Dancing jazz, drinking jazz.” He says the VEC got inspired to make some welcome functional and aesthetic improvements to the space, which for many years has been home to both performance art and social activism. “They made the stage bigger, and put up the beautiful curtains,” he says. I mention I’ve noticed that the grand bar in the space is also being renovated. “[Speakeasy] has been a catalyst for a lot of things around there,” he confirms. A question many will ask is whether non-dancers can still have fun and feel welcome at Speakeasy. The answer is an enthusiastic yes. While most who attend are the town’s in-the-know dancers, both McCagherty and Nordal say they welcome all comers. Diversity, McCagherty says, is an important part of creating the traditional jazz vibe in the room. I’ve experienced VEC’s Speakeasy from three angles now. I’ve been a guest performer filling the Capital City Syncopators’ set break (McCagherty’s band plays every other week, and he books the acts for alternate Tuesdays; he is wonderfully generous this way, offering myriad opportunities for musicians to contribute on stage). I’ve been a social dancer on the floor. And I’ve sat at a table with friends to have a couple of drinks, joyfully taking it all in. My conclusion is that if you can manage the stairs (there’s no other way to get up there), prefer live music to live streaming, and crave those face-to-face, convivial social experiences of days gone by, Speakeasy is most definitely for you. 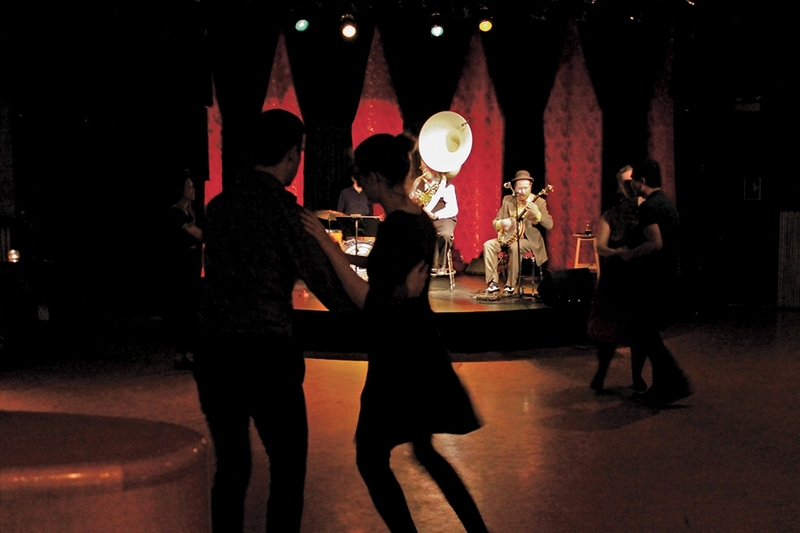 “Speakeasy,” featuring bi-weekly performances by the Capital City Syncopators, every Tuesday night 8pm–1am, $10, Victoria Event Centre, 1415 Broad Street. Mollie Kaye celebrates Victoria’s creative people and passion projects. Contact her at molliek@shaw.ca if there is a performance you’d like to see featured (three months’ advance notice required).